Home › News › Reliable, Long-Lasting and Powerful! 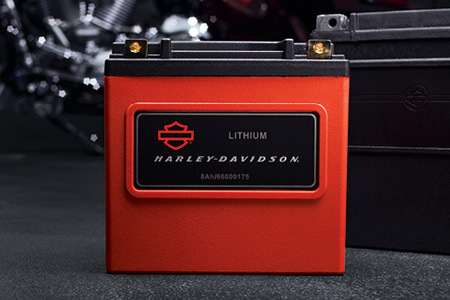 Harley-Davidson® Genuine Parts & Accessories offers the latest in battery technology following exacting test standards to ensure optimal power, long life and reliability. H-D™ AGM batteries have been the standard option for H-D® motorcycle enthusiasts, but now P&A offers you a new choice for powering your ride. Lithium LiFe Batteries, made with lithium iron phosphate, feature superior cranking amps, notable weight reduction and an increased lifespan over H-D AGM lead-acid batteries all with minimal maintenance. The many benefits unique to Lithium LiFe Batteries paired with the Dual Mode Battery Tender contribute to keeping your motorcycle charged and on the road. LITHIUM LiFe BATTERY LiFe batteries provide an impressive life span of more than double H-D™ AGM batteries and require only one charge per riding season. Three LiFe battery options are available depending on motorcycle fitment and each vary in cranking amps and weight. Included with the 8Ah and 6Ah batteries is a caddy that ensures the LiFe battery fits perfectly into the battery compartment of your specific motorcycle. DUAL MODE BATTERY TENDER The Dual Mode Battery Tender is perfect for short- or long term charging needs. Selectable charge options, with an LED front panel to indicate charge progress, provide optimal charging for your Lithium LiFe and AGM batteries. The water resistant housing ensures the perfect charge even if moisture gets into your storage area, and the vibration— and shock resistant tender is reverse polarity protected and spark-proof, even when the leads touch.